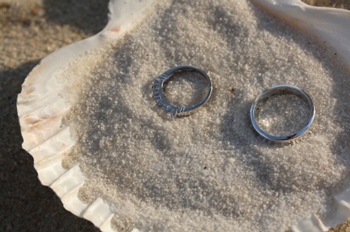 Many couples are looking for cheap beach wedding ideas for their Florida beach wedding. Cheap wedding planning tips have replaced the desire for an expensive ceremony. The fat, over-blown wedding of the boom-boom late 90's has been deflated to where it is now unrecognizable. Young couple see no need to burden themselves or their parents with extravagant expenses. Weddings on the Florida beaches are becoming more popular each month. Saving money on those Florida beach weddings and finding the best cheap wedding planning tips has become the new badge of honor. The Florida beaches provide a natural romantic setting, wedding attire for the premier couple and guests can be casual, stylish and inexpensive...and $1000's of dollars can be saved on decorations and the reception. Couples are finding that they not only enjoy looking for ways to save expense for their parents, but that they grow much closer in the process. * Start planning as early as possible. If will give you lots of time to chase down information and make contacts to get prices. * Start your search online. Click ads, write down notes, and keep them organized. * The best way to stay organized is to use To-Do lists. Check off items as you go. Leave space between items for other inexpensive ideas. * A Florida beach wedding requires lots of attention for making reservations with city or county agencies. Start early because there will definitely be a learning curve. * When you looking for a beach to have your ceremony, start with thinking about where everyone will park. This is one reason why the Sunset Beach Pavilion on Treasure Island is so popular. You can rent the parking lot for a low fee. * Do your own invitations. With a laptop and printer you can purchase blank cards at places like Michael's or Party City and choose a font that looks clean and elegant. * Forget about an inner envelope and blotter paper. * Ask guests to reply by eMail or by texting. * You want to cut costs, but maintain style. Make sure you include guidelines for guests on what to wear to a beach wedding... especially the guys who are invited . * Think about who you know that could handle the photography with their digital camera, act as the DJ, and even perform the ceremony. * The great thing about a cheap Florida beach wedding for the bride is the price of a cute sundress for her bridal outfit. They run between $79 and $175. Make sure you get a short style so it does not get ruined by the salt water if you plan to wade into the Gulf and cast off a note in a bottle. A Florida beach wedding location has such natural beauty that you want to add as little as possible. Decorations should be subtle, tied to the landscape, and unobtrusive. 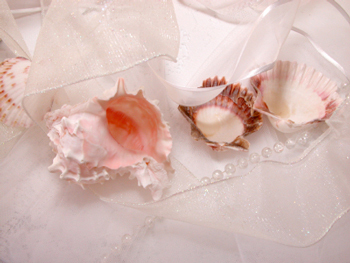 * Think shells for both decoration and gifts to your guests. * Most Florida beach communities have a shell shop of some sort. You can find beautiful pieces for less than a $2 each. * Purchase lengths of elegant, but cheap lace ribbon at a place like Joann's or Michael's and bunch it as a centerpiece on each of the tables at your reception. Place a number of uniquely-colored small shells to hold it down. Let the guests know they are free to take one as a blessing for coming. A simple gold band has signified devoted love for centuries. If there is something you want, but can't afford now...consider purchasing it on your 5th or 10th anniversary. * If color doesn't matter, white gold is a lot less expensive. * Think about having a family heirloom ring resized. * You can save more by purchasing a coordinated set of wedding bands with your engagement ring. * You might want to consider titanium or tungsten rings. * Do NOT allow a jeweler to "guilt" you into upgrading to a more expensive set. This is your wedding and there are plenty of places to buy wedding bands. Cheap beach wedding ideas are limitless. Engage friends and family members in your quest to have a beautiful, classy, and inexpensive Florida beach wedding.